Washington (CNN) -- In a warm, fluorescent-lit clay studio at the Corcoran College of Art + Design, students, faculty and a soft-spoken priest are embarking on a mission. Their goal: Create 500 bowls for a fundraiser to help feed the hungry. "There are over 9,000 homeless people in the nation's capital," says the Rev. John Adams, who has been trying to break the cycle of homelessness and hunger in Washington for more than 30 years as president of So Others Might Eat. The interfaith, community-based organization, which is in its 40th year, serves more than 1,000 meals a day and provides nearly 300 housing units to homeless and hungry people in Washington. "We are in sight of the Capitol and still we have many, many homeless people who need our help," Adams said. "We've seen over a 10 percent increase in the meals we are serving this past year. We've seen a 17 percent increase in the people coming to our medical clinic. Our housing we provide is 100 percent full. "[The recession] is really affecting the poor." Each year, So Others Might Eat hosts an Empty Bowls event where, for a $20 donation, guests are served a soup supper and given a handmade clay bowl. 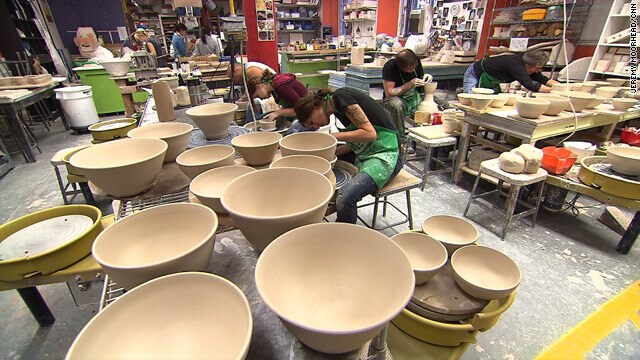 The events raise thousands of dollars for the organization, with local potters, studios and schools making and donating the bowls, and restaurants and shops donating the food. This year, for the first time, the group is partnering with the Corcoran to help supply bowls for the fundraiser in March 2010. The bowls are intended as symbols of hunger. "It's a wonderful event to have these artists come here today to help feed the needy in our city," Adams says. However, making bowls is no easy task. "We are working on a collaborative effort with So Other Might Eat," says Bob Devers, coordinator of ceramics at the Corcoran College of Art + Design. "We promised to produce 500 bowls for their charity fundraiser." The studio is busy at work, with students and faculty -- and even Adams -- cutting, kneading and spinning the clay into works of art. Corcoran student Jeff Herrity has been working with clay for 10 years, but he's still excited to sit down and create bowls that someone will put to use. "It's great to spend an entire day making bowls and thinking about what they will be used for, Herrity said. "We get to sit next to our fellow students and learn their techniques. It's a fun activity for us at the clay program." Herrity sits on his stool contently, gazing at the clay shape as it opens up into a bowl, thinking about what will go inside. "It's going to have a life after it comes off this wheel, after it gets fired and glazed, it will be used for something." As Adams takes a break from designing his first bowl, he looks around and talks with students and faculty. He can't help but be impressed. "We have great artists and great people here who are interested in helping people in the city," he says. Taking time to donate their creative energies, especially during the holiday season, means a lot to Adams. "The holidays remind us of giving thanks for what we have, but also the opportunities we have for reaching out to others that don't have," he says.